INTRODUCING THE JHM PERFORMANCE 0A3 TRANSMISSION REBUILT TRANSMISSION! 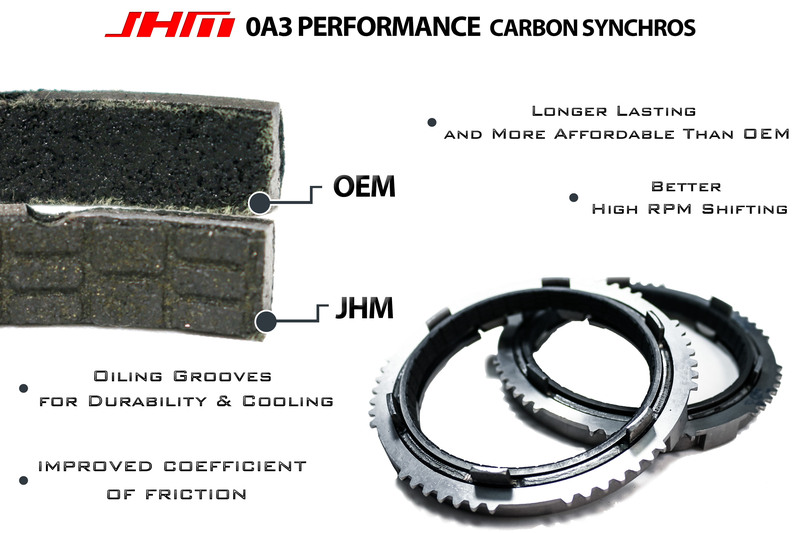 We have been testing and abusing our JHM Performance Carbon Synchros for the 0A3 Transmission since 2013 in our Supercharged S4 and RS4s. We have been putting them to the ultimate test to make sure they can handle all the abuse we throw at them. We have improved upon the OEM Design featuring an improved coefficient of friction VS OEM which will result in better high RPM shifting. Our oiling grooves will provide better cooling to the synchros increasing the durability making them longer lasting. Best of all, they cost less than OEM synchros making these an incredible bang for your buck. NOTE: This is a FULLY REBUILT 0A3 Transmission for the B6-B7 S4. Is your transmission going bad? Do you have synchro issues and gear crunching? Do you have trouble getting into gear? Is your shifter randomly popping out of gear? If you have any of these issues and you want to fix your transmission issues right the first time, this is the Transmission for you! 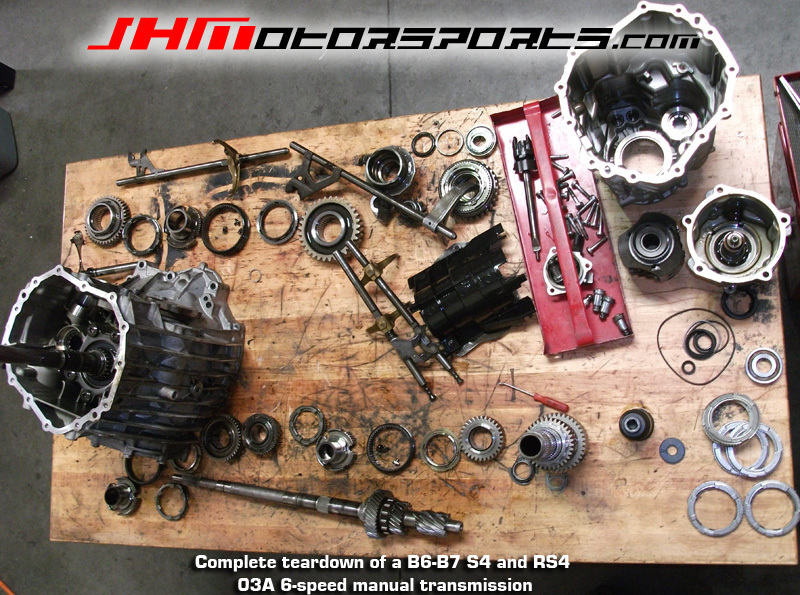 Here at JHM, we've been rebuilding these transmissions since 2008. The most common issue that we see on these transmission is crunching or popping out of 1st or 2nd gears. 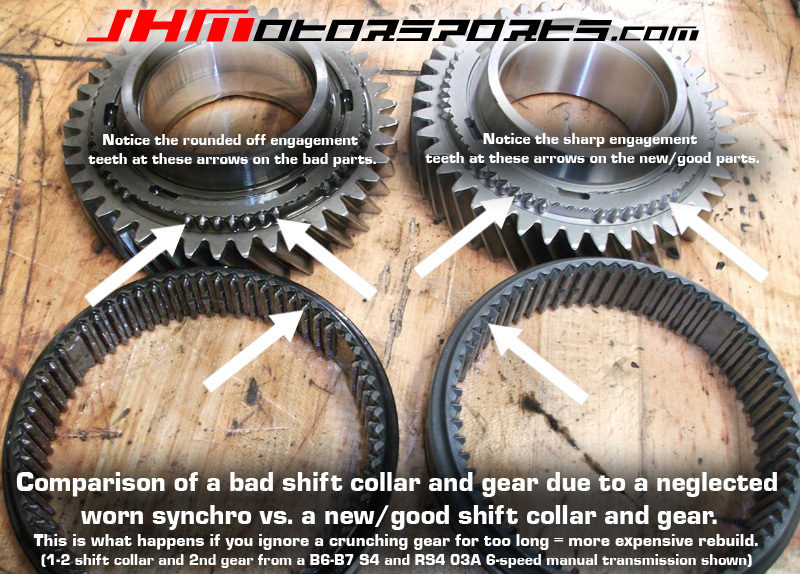 In about 95% of the 0A3 transmissions we have rebuilt, the 1-2 Shift Collar and Second Gear are finished. That is why we include an OEM, UPDATED second gear. We want these Rebuilt Transmissions to last as long as the OEM Transmission did or longer. This is not just a quick "synchro slap" or basic rebuild. This is a rebuilt transmission that has been fully torn down and inspected and REBUILT with OEM, Updated parts. The second most common issue that we've run into on these transmissions is crunching or issues with 3rd and 4th gear popping out. We've only seen this on about 40% to 50% of the transmissions we've rebuilt and can provide parts for this issue as needed. When you purchase this JHM Rebuilt Transmission, we will send you a completely rebuilt 0A3 Transmission with all of the parts in our 0A3 6-Speed Rebuild Kit (OEM) Full for the B6-B7 S4. 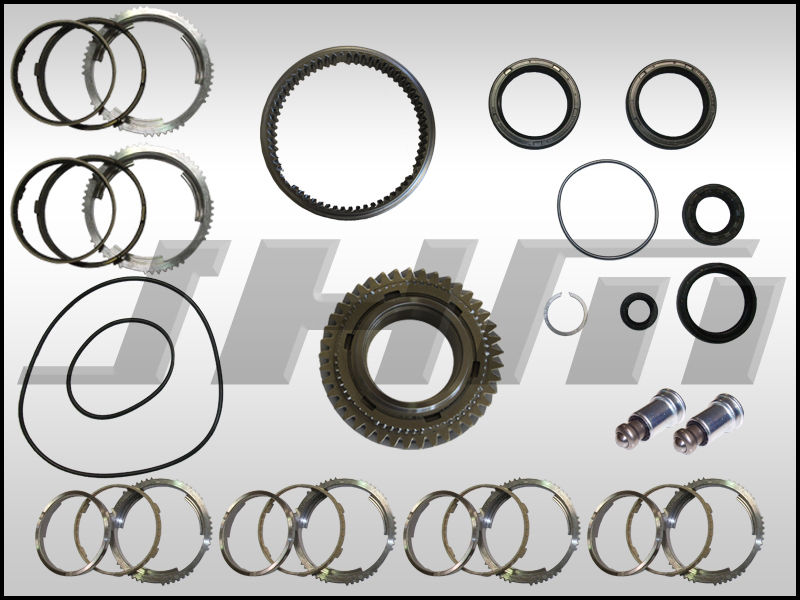 This kit features an OEM, updated 1 - 2 Shift Collar and a new, OEM 2nd Gear. - OEM Selector Shaft Detents (2). Even though these detents are reusable we include them for several reasons. It's best to replace the two detents at the selector shaft. Also, on some early 2004 S4s there was a reverse lockout issue and these updated detents fix that issue. Finally, sometimes these detents get damaged upon removal so it is good to have replacements when doing a rebuild. Please select "No Shipping, Local Pickup" as your shipping option when you place your order. Once your rebuilt JHM Transmission purchase is received, we will contact you to verify the shipping address and the freight options you would like. We will contact you to collect the freight charges for shipping your transmission to you based on your location and needs. 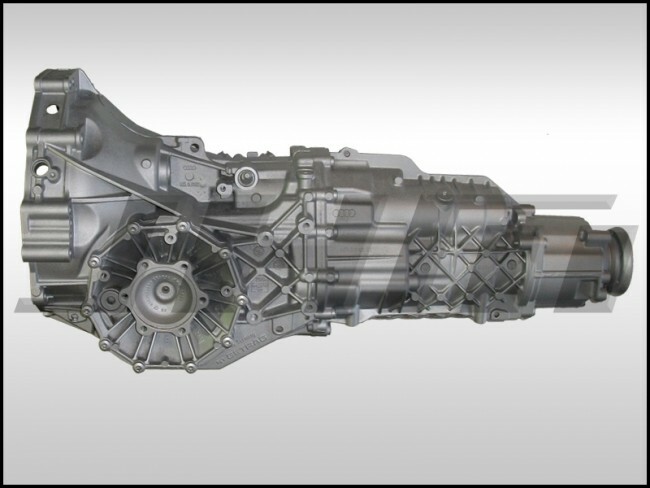 Additionally, we can work with you to arrange return shipping of your old transmission core. Shipping costs will vary based on your location and needs but should fall within $150 to $300 each way for customers in the Continental United States. Please call or email us for shipping quotes to international addresses. For example, if the only things that are wrong with your 0A3 Transmission are fixed by our FULL REBUILD KIT, you will get 100% of your core charge credited to your JHM Account or your original payment method. If, for example, your transmission needs a new 3rd gear IN ADDITION to the items included in the FULL REBUILD KIT, you will get the amount of your core charge back less the current cost of a 0A3 B6-B7 S4 3rd gear. As of 9-1-2012, a 0A3 3rd gear is selling at a retail price of $285.00. The JHMotorsports price on this gear is $270. That would mean you would get $1500 - $270 or $1230 back from your core charge. If you do not need the complete kit or need just the parts to make a repair please email sales@jhmotorsports.com for pricing. We do not offer them separate without talking to our customers. We want to speak with you and make sure you get exactly what you need. For most customers, you will need to select the core type that came out of YOUR B6-B7 S4 (or the core type you will be sending back to us after you install our pre-built core). If you have a B6-S4 or Early Build 2005.5 B7-S4 (Trans codes are HEP, FVD or HSM), you will most likely have an Early Style Transmission with the T2 Center Differential. If you have a 2006 - 2009 B7-S4 (Trans codes are HVM, JMF) you will most likely have a Late Style Transmission with the T3 Center Differential. If you return a core back to us other than the one selected when you make the purchase, you will be refunded your core charge based off of the core we receive. NOTE ON DETERMINING YOUR TRANSMISSION TYPE: If you have a 2005.5 B7-S4 and you are unsure of the transmission style you have, you can look for a three letter code on the bottom of the transmission case. If you have a B7-S4 with the T3 style differential (model years 2005.5 - 2008), your transmission case will have the 3 letter code HVM. The retail price on these Rebuild Kit parts ALONE from a dealer as of 8-1-2012 is over $2000. And this is only if you can get them to help you pick out the individual parts required for a rebuild and not just have them try to sell you a brand new, complete transmission. So you save almost $400 on the Rebuild Parts alone by going with our JHM Rebuilt Transmission Core. If you are not in CA you will save on tax as well. We also provide this rebuild service here at our shop in Lathrop, CA. Please contact us at sales@jhmotorsports.com to get an estimate for your rebuild. **SHIPPING NOTE:** ALL JHM FULLY REBUILT Transmission Cores are shipped EMPTY, i.e. WITHOUT gear oil. Don't forget to add 4x Quarts of either our Red Line or Motul Manual Transmission Gear Oil to your order so you can fill your newly rebuilt transmission for installation. JHM Rebuilt Transmissions usually ship out from our location 1 to 4 days after the order is placed, depending on our current stock. 90% of the time we have these cores IN STOCK and READY TO SHIP! REMEMBER: DO NOT SELECT A SHIPPING METHOD FOR THIS PRODUCT!!! Select "No Shipping, Local Pickup" and we will contact you to collect the costs for freight to your address. For shipping quotes: Please contact us with your full shipping address (Name or Shop/Business Name, Street Address, Zip Code, Phone Number, Email). We will get you a shipping quote for a Fully Rebuilt Transmission sent directly to your or your shop's address.